Pre-sliced watermelon, honeydew and cantaloupe on a red paper plate. 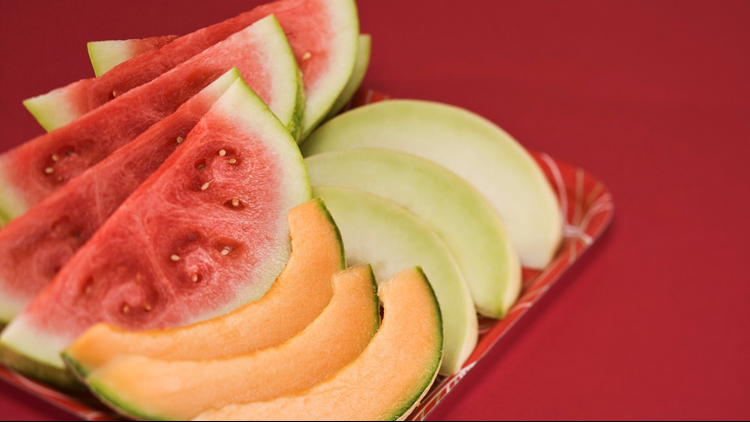 Several varieties of pre-cut melon are being recalled because of the risk of salmonella. The products include cantaloupe, honeydew, watermelon and a combination of these melons. According to the U.S. Food and Drug Administration, Caito Foods LLC of Indianapolis recalled the products because of the potential of salmonella contamination. The FDA and the Centers for Disease Control and Prevention traced the distribution of pre-cut melon mixes from individuals who got sick back to Caito Foods LLC. Consumers should not eat the recalled pre-cut melon products that were packaged in clear, plastic clamshell containers and distributed in Illinois, Indiana, Iowa, Kansas, Kentucky, Michigan, Minnesota, Missouri, Nebraska, New York, North Carolina, Ohio, Pennsylvania, Tennessee, West Virginia and Wisconsin. People who bought pre-cut melon products and cannot determine if they were produced by Caito Foods LLC should throw them away.